-Don’t give all your prints/gifts away right at the start. It is tempting to run to your grandparents or loved ones to give them the beautiful products you have ordered for them, but it’s really special to also hold onto those until a holiday or birthday rolls around. They will give you long lasting memories to enjoy, and will also extend the time when you have the anticipation of sharing the images with the people you love. -Make a small display with photo clips: Photo clips are a more casual way to display photos, and they can look really adorable above a bed or desk. A garland like this has fairy lights attached, and is perfect for a boho, dreamy look, and it’s under $20! The only drawback is that the photos do get small marks on them from the clip portions, so be sure to utilize the images that you have multiple copies of. It’s also really cute when you trim your images into squares from the prints, in order to give a look close to Instagram squares for this particular look. -Mix in matted and framed prints into a gallery wall: A lot of the latest trends include large gallery walls. We recommend searching for trendy prints at places like Hobby Lobby and Home Goods in order to achieve something that doesn’t look very dated, especially in a dorm room. Aim for one consistent factor, like rustic frames or gold edges, because this makes it look very cohesive and polished. Hang them with one edge (top or bottom) even to the ground, but stagger the rest of the display to make it more casual. Don’t utilize more than 2 senior images in a gallery wall to avoid it being overwhelming, and intermix family photos and candid shots with the framed quotes or decor items. -Short on space? The dollar store and other big box retailers have magnetic frames that are used for lockers or refrigerators, but you can attach them to a large piece of metal and hang it next to a letterboard or in a gallery wall to give yourself another surface to hang photos that you may want to change out more often. It is also an affordable way to display the images for a short time period. You can also do a gallery on your actual fridge if you are in a tiny space and don’t have the ability to hammer nails into the wall. -Display photo books with your other coffee table books: Mix in your printed albums with other home design books or interesting photo documentary books for a cool coffee table look. It also gives guests something fun to look at while they sit in your living area or dorm room. People love looking at photo books, and they can also break the ice for new friends! We always have an ordering session with our clients, in order to help them select the items that best fit their needs. Please let us know if you have something special in mind! With the new year comes a certain amount of reflection. As a photographer, the year is full of ups and downs, and you learn a lot of things about the industry and yourself at the same time. For me, I know that I’ve grown immensely over the many years that I’ve done photography, and in reflection, I can narrow some of those things down to a few great decisions that I’ve made. Our choices guide who we end up being, after all, and I’m happy to say that, for the most part, I’ve been able to choose some great things. Here are a few of the best decisions I’ve made as a photographer! Opened myself up to learn from others - When you’re fresh in the field as a new photographer, you can feel overwhelmed, and scared to ask questions from veterans around you. You want to prove that you can make it on your own, after all, and asking someone for help would signal that you aren’t what you make yourself out to be - right? I was prone to the same mindset, as I think we all are to some degree, and I had to make the decision to seek to learn from those around me. Nowadays, since I’m one of those veterans, I am constantly inspired by the creativity of my peers, and I love being a part of a community that seeks to help each other. It’s one of the best decisions I’ve made! Never let an obstacle get the best of me - Beautiful photos are made by pouring your soul into them. As a photographer, my mind is always buzzing with ideas, and I love the challenge of bringing those ideas to life. Early on, I’ve had to make the decision to work hard to make my ideas happen, because there were always many obstacles I had to claw and scrape over to make my dreams real. This isn’t just true for photographers, either - every one of us has to make the decision not to let an obstacle get the best of us, and at the same time recognize that some obstacles are there for a reason. Now, I embrace the challenges, and sometimes even crave them, as they fuel my creativity. Accepted failure and learn from mistakes - Sometimes, it just doesn’t work out. For me, this has shown up the most in scenes I’ve had in my head that I tried to recreate. I would try and try to make it happen, but in the end the pieces just don’t come together, and I have to make the decision either to force them together, or let it go. It’s been a hard decision, but over time, I’ve learned to become more comfortable with failure and see it instead as an opportunity to grow in my skill. This is a good decision to make earlier in life, because when we aren’t comfortable with failure, we let it ruin our worlds. Some of the best lessons I’ve learned are from swallowing my pride, and allowing a failure to be a failure. Made time to sit and be quiet - This is one that took me a while to decide on. We only have 24 hours in a day, and if you’re starting your own business or working freelance, you know that you’re spending 14 or so of those hours working, and the rest trying to set your buzzing mind to rest and prepare for bed and the next day. I took my creativity for granted, because it came to me easily - until it didn’t. Like writer’s block, sometimes I would have a hard time coming up with new ideas. I had to realize that, to be creative, I had to slow down and be quiet, and let my mind wander on its own, without other distractions. Once I decided to do this, I came up with ideas for scenes, locations, and themes that I wouldn’t have come up with otherwise. Those are some of the best decisions I’ve made so far as a photographer. Life presents a ton of choices every day, and each decision we’re making is changing us. Are you becoming who you want to be? Alyssa is someone who loves nature. She is someone who sees the value in beautiful greenery, pretty blue skies, and soft green grass, and she wanted her session to include her love of the outdoors. 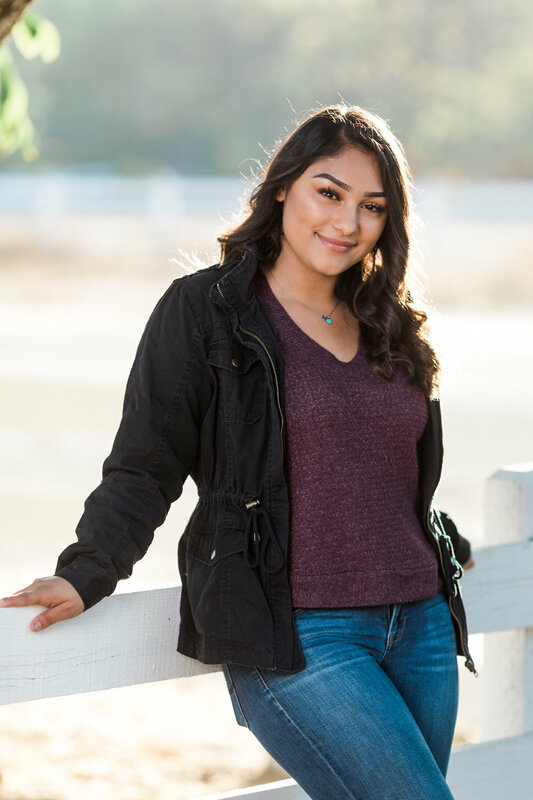 This beautiful and thoughtful young woman is a senior at Righetti High School, and she has a big heart for other people. One of the ways she exemplifies this is her service through Project Angel Food, which provides nutritious meal services to those who are critically ill. The program was born from the idea that the sick and underprivileged often do not have access to healthy food, so they provide it free of charge. They deliver over 11,000 meals each week to men, women, and children in need. Besides volunteering with this important program, Alyssa also has worked a part-time job at a local Christian school. She loves spending time with her family and friends, attending her local youth group, and going to the football games at her school. “My friends would say I am outgoing, because I enjoy meeting new people”, she says, “I’m pretty independent, and I’m always talking to everyone.” Her sweet spirit is magnetic, and it’s no wonder why people flock to this darling girl. One of her biggest role models is her mom (and her aunt), who she calls “the strongest women I know”. After graduation, she plans to employ her love of helping others by entering the medical field, and hopes in five years to be “happy and stable”. I have no doubt that she will achieve both those goals, because she is so committed to improving the lives of others around her. That’s the meaning of true success, and she is wise to know that at such a young age. Alyssa, I’m blessed to know you! Congratulations! Are you a junior or senior? If so, it’s time to begin thinking about your senior photos. You can contact us anytime to get started on the booking process, and to secure the date you want! Kylie’s got the kind of smile that makes the world go ‘round. She’s graduating this year, and already seems like she’s well on the way to changing the world! For her senior session, we visited the beach, which is Kylie’s favorite place to be; she’s a true beach girl. The weather was perfect for a trip to the coast, and we got some wonderful portraits for her senior photos. She has a free spirit in her, and her style shows it off in the prettiest of ways. She loves dressing in boho-inspired outfits, and she picked out some of the prettiest outfits that complimented her gorgeous skin tone. Boho is definitely one of my favorites, especially for its hearkening back to some of the good ol’ days. I like to see modern styles incorporating this retro aesthetic, and love to see girls today embodying the health conscious ideals that gave birth to boho. Kylie’s wardrobe is a great example of this, with its looser fit and kaftan-esque styles, and she wore them so well! She already had a happy personality, but the closer we got to the sea, the more she beamed. She was a natural at posing, and it was a joy to capture her lovely soul in her senior photos. We all had a lot of fun exploring the shoreline for good spots to stop at, and Kylie’s mom brought along a colorful chair to use as a prop. It was the perfect accent, standing out against the blue sea in the backdrop and adding even more interest to the shot. Nothing could steal the show from Kylie, though; she was the shining star of the session! It’s days like these, spent with happy people in beautiful places, that make me want to pinch myself to see if I’m dreaming. I still can’t believe that I get to pursue my passions every day, and meet so many wonderful people along the way. It’s truly a gift, and it’s not one that I ever want to take for granted. It was a joy to meet Kylie, and I wish her all the best in her future, wherever it takes her. Congratulations! Contact us HERE for more info! Very rarely in life do you come across someone like Lainey. She has the sweetest soul, and the kindest personality; she turned a regular senior session into one of the most fun and lovely times that I’ve had in a while. Lainey hails from Lompoc High School, and plans on attending a four year university when the time comes, but isn’t sure about her major yet. While she may not know at the moment, she has faith in herself that she’ll figure it out soon, and do something that she truly loves. Shouldn’t that be the goal for every high school graduate? Lainey is a part of many groups at her school, namely California Scholarship Federation, Brave Women’s Club, Associate Student Body, Sapphire Dance Team, Thespian Troupe and Drama. She’s a busy bee, but she’s made some wonderful memories with these groups, especially her favorite of seeing Hamilton in LA with her drama friends. Lainey had a bohemian vision for her session, and she came well prepared with her wardrobe. It fit her creative personality, and we made a point of capturing that in her session. Her friends describe her as ‘a lover by nature’, and ‘always up for an adventure’; they must know her well! She has a passion for helping people, and hopes to one day be fully enlisted in the peace corps, traveling to do missions work while learning about all of the different cultures and peoples around the world. It’s a wonderful passion to see in someone so young, and it came from somewhere. I've known her family basically for forever, and I took pictures of her older sister, Riley, who is a phenomenal makeup artist. They're a lovely family! Lainey looks up to her grandfather and her dad: “My grandfather passed away when I was younger, but he’s always been in the back of my head, and still teaches me and helps in making tough decisions.” She said, “My dad is basically a reincarnation of my grandpa, and I look up to both of them, probably more than they think I do. They are true heroes, and have taught me the morals that I hold dear to my heart each day.” With such amazing heroes in Lainey's life, it’s no wonder that she’s who she is today. It was wonderful to capture her sweet soul in her senior photos. The colors and atmosphere of the day were gorgeous, but none could match Lainey’s looks. I hope that she keeps that bubbly and creative personality of hers as she works towards her dream job, and continues to hold her morals dear. Congratulations, Lainey! It’s a joy of mine to meet and work with people like Erica. She’s a smart woman with the most wonderful character, and we such a fun time in her session! She’s graduating from Roncalli High School in Aberdeen, South Dakota, and she’s planning on continuing her schooling for a nursing degree. Her mother and I go way back, all the way back to our college days. We were both traveling respiratory therapists at the same hospital, and have been great friends ever since. Erica and her mom have been looking forward to their trip to Cali for a while, and loved being tourists again, seeing the sights and going to a P!nk concert (jealous!). Erica loves the area out here, and we wanted to capture her in her favorite spots for her senior session. Since she hails from a landlocked state, she had to visit the beach, so we hit Pismo for the pier, and then on to Montana de Oro for the beautiful rocky shores. She seemed to feel right at home with her feet in the sand, breathing in the salty air, and she made it so easy to capture her unique spirit in her senior pictures. She has a marvelous sense of humor, which made for lots of laughs as we spent some time in the glorious California sun. She shares her mother’s selfless spirit, and is passionate about caring for others. She chose nursing for her career because she wants to make a difference in the lives of others, and I think it’s the perfect fit for her. Her mother’s set a great example for her, being Erica’s personal hero, and remains to be an inspiration to her today! I loved the outfits that Erica wore to her session. She brought a variety with her, from jeans with a lovely striped top and cardigan, to an elegantly gorgeous dress that made her shine wonderfully against the watery horizon of the beach. It was so fun just chatting with her, and getting to know the inner beauty that matched her stellar looks. In her high school, she loves to play volleyball, and is a member of the National Honor Society. Becoming a member was one of her favorite memories from her time in there, and rightly so; it’s an incredible achievement! I know that’s only one of the many great things that Erica has done and will do in her life. The way she lives her life is a testament to it, and I wish her all the best in this next stage of life. Congrats Erica! I've been documenting pieces of Sadie's remarkable life since she was just a little girl. So, her senior session felt extra-memorable to me; given that I've known her for so many years. Sadie is one of the most humble, down-to-earth, and authentic humans that I've been privileged to know, and I can't wait to see where her future is going to take her. As a senior at Family Partnership Charter School, she has stayed extremely busy. She participates in high school rodeo, and has quite a talent for the demanding sport; competing in barrel racing, team roping, breakaway roping, goat tying, pole bending, cutting, and reined cow horse. In addition, she works part time at the R42 Ranch exercising horses and also training them...I have no idea how she juggles such a busy schedule! "Some of my favorite memories from high school include qualifying for the high school rodeo state finals in 5 events and winning the All Around Cowgirl Saddle", she explained, "In five years, I'd love to be competing in the pro rodeo circuit, and working for a western lifestyle brand." One of the people she looks up to most is her stepmom Marna, adding, "My stepmom is the most selfless, kind, strong, and humble person I know. She is my biggest fan and my best friend. I am truly beyond blessed to have her in my life, and I hope my own classmates remember me as someone who was kind, humble, helpful, and sweet." Sadie has big plans for after graduation (besides making it the pro circuit) and hopes to also earn her bachelors in Agricultural Communications with a minor in Marketing at Cal Poly. When it came time to dream up her senior session, of course, we included horses as a nod to her love of animals. I had no idea she could pull off these very stylish and chic looks when we shot at her family property in Buellton, California....she's truly a girl of many talents! Besides being so incredibly smart and athletic, she also is passionate about helping others and supports causes like the special olympics and helping children through animal therapy. Sadie, I am thankful to know you, and so grateful I've been part of your life through photography for all these years. You're going to do some amazing things in the future, and I am privileged to be on the sidelines, cheering you on. Somehow, I got to be the lucky photographer that gets to work with seniors like these. Meet the last two members of my incredible VIP team: Kylie and Madison. I can't even describe how wonderful it is to meet young people who are firm in who they are, who have personalities that are bigger than life, and who are eager to represent my brand in such an incredible way. The vision for my VIP team has never changed, but getting to meet new seniors every year really keeps things fresh. Kylie loves the color blue, and is a very outgoing and fun girl. She also enjoys using Instagram, and shopping is one of her favorite hobbies. The medical field is where she hopes to one day start her career. Her personal style includes pieces that are sporty, trendy, and super chic, so it was really fun to draw inspiration from her own wardrobe. Maddie says her favorite restaurant is Chick-Fil-a, and that her favorite drink is a Frappucino! Besides these tasty items, she also loves shopping on Amazon, and spending time at the beach. Her dream job would be working as an orthopedic surgeon one day. When it comes to fashion, she loves trendy pieces and minimal makeup looks. Be on the lookout for more from these darling girls! Every year, I seem to meet more amazing seniors. I always think, "there is no way this year's group can compare to last year's", but they always surprise and delight me with their wit, passion and confidence. I will be introducing my full team here on the blog, member by member, as well as sharing their full sessions as the year progresses. I also give my team the opportunity to participate in special events and photoshoots, so you'll see those here, too. First up, meet Jillian and Maile. They are two of my VIP clients, and also good friends with one another. I think they absolutely crushed this first model shoot, and they really took on the inspiration I had for them, which was "out of your comfort zone"...I wanted everyone to branch out when it comes to wardrobe and styling. We did this shoot at the gorgeous Presqu’ile Winery, where I am also a member. I love the stunning scenery there, and the view is fantastic. I am so grateful we were allowed to shoot there. Maile (pronounced Miley) is a vivacious and fun senior who says her favorite colors are mint green and blue, which are both fitting for such a bright girl. She loves mexican food, and you can usually find her on Snapchat, sharing pics of her friends and family! Someday, she would love to work as a youth counselor or special education teacher. Lastly, she loves the beach! I can't wait to show you more images from her as our year together continues! Jillian is more of a fan of Twitter, and her favorite color is bright yellow! She is another fun, loving young lady, who dreams of becoming a teacher after graduation. Being with her friends and family is her favorite way to spend a free day, and she loves wearing boho and casual trends when it comes to her wardrobe, Unlike her friend Maile, you'd be more likely to find her at home in the mountains instead of the beach! Hope you enjoy this little snapshot of both of these incredibly lovely girls!